All About Fernando de Noronha Island in Brazil. Fernando de Noronha, Brazil’s paradise on earth lies 545 kilometers away from the Brazilian coast. Noronha is comprised of twenty islands emerging from Atlantic Ocean. This Brazilian hidden treasure is allowed to accommodate only 420 tourists at a given time slot. Booking your hotel or choosing on a package in advance is recommended for anybody looking to be among the 400’s lucky tourists. Our experts can give you valuable advice on your Noronha package arrangements as well as probably save you lots of cash. The island is famous for quite turtles conserved by Projeto Tamar and also for energetic spinner dolphins seen at the dolphin bay. Numerous natural attractions include beautiful beaches filled with clean sand, crystal clear water, scuba diving, snorkeling, and boat tours. This scared ecological sanctuary is the perfect dream paradise. Life at Fernando de Noronha is different from the rest of the world. It is a quiet locality giving importance to nature and beauty unlike the world’s rat race for power. Life is slow, easy going and casual. You are bound to feel safe in the arms of the Noronha islands. The beach is associated with laughter, sand and surf and it’s no different at the Fernando de Noronha Island. 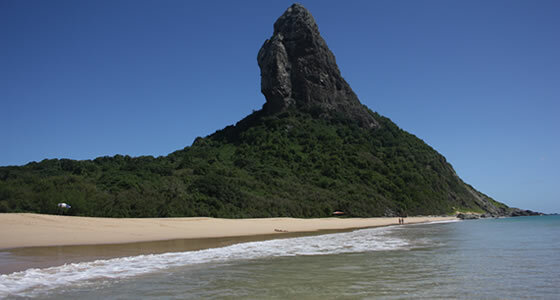 This Brazilian Hawaii is a favorite among surfers and divers for the bright yellow sun and its deep blue waters. The 21 unique beaches are a treat to those living here and are surely fun promising.